This special adaptation of Dickens’ classic Christmas tale will see Derek Jacobi play the famous miser Ebenezer Scrooge in the BBC’s ‘professional’ production of A Christmas Carol - until it is hijacked by the Cornley Polytechnic Drama Society and he is hauled out while on air! 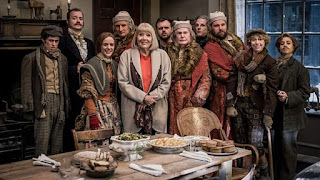 Diana Rigg is playing the aunt of Sandra, one of the Cornley crew, and will also step in as the narrator, as well as on the accelerator as she races against the clock to make it to the recording before the curtains close. Mischief Theatre’s A Christmas Carol Goes Wrong is a BBC Studios Production for BBC One and is being filmed at MediaCity UK in Salford.